Bhel Puri is an easy and delicious snack hawked by street vendors all over India. It is easy to make especially since one can buy various snack mixes in Indian markets; some of them come with a chutney packet. I add whatever vegetables are handy or seasonal with an eye for color. Lots of crunchy veggies amp up the nutritive value and make it into more of a meal - the more the merrier and tastier too :D. Bhel Puri is delightful as it offers a wide range of textures and flavors - soft to crunchy and salty, sour, hot and sweet. The recipe given below is merely an example; you don't have to add all of the ingredients; feel free to experiment and find your own favorites. Bhel Puri can be quite simple too; the basic ingredients you need are rice crispies/puffed rice, or packaged Bhel Puri mix and a little lime juice and/or chutneys. Add a bit of chopped onions and cilantro and you will have a dainty dish to set before a king! Indian puffed rice is a must in making Bhel Puri; it is also a simple but wonderful snack all on its own. If it is not fresh and crisp, place in a baking pan and refresh by baking in a warm oven (350 F) for a few minutes. Bhel Puri mix, puffed rice (also called pori or murmura in Tamil and Hindi respectively), and other ingredients are available in Indian markets. The charm of Bhel Puri is in its freshness. Mix all the veggies and add chutneys and lime juice to taste just before eating. 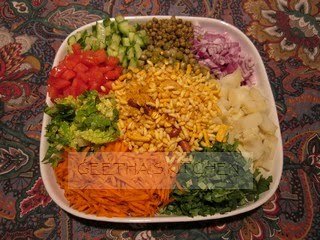 Mix in the Bhel Puri mix, serve and eat immediately. Enjoy!! where is the puri? U also need broken puris to mix in as well as an unbroken one to decorate on top! Hi Anon, You are right, where is the puri indeed? I have done away with the puris for so long that I forgot about them. While leaving out the puris make it gluten free, it does not detract from either the taste or nutrition. For a more traditional Bhel Puri, a few crushed puris may be mixed with the snack mix and individual servings garnished a whole one.